5. Tile remnants of these tiles have been found on the Temple Mount, so there was evidently another chapel with this same floor built by the Crusaders on the Temple Mount during the 12th C.
All are made of local black bituminous limestone and hard red limestone, and imported white marble. All tile sizes seem to be based on the inch. Here is a heartening story that went out in a recent newsletter from Thomas More College of Liberal Arts descrbes how college senior, Amy Green is designing a Cosmatesque floor for her parish, Good Shepherd Catholic Church in Driggs, Idaho. She is doing this through the weekly Guild of St Luke art class at the college. The article below was written by student Marlene Schuler, Class of 2017. In this Amy describes how this will be done through members of the parish volunteering their time to lay the tiles. She told me in addition that these professional tilers had also managed to negotiate a deal with the tile supplier, who offered them a good price simply because he was taken by how unusual this project is. This is the sort of result that makes it all worthwhile for me. I'm sure Amy will do a great job! Another point is that the article doesn't say so, but as this is done on a limited budget, they would welcome donations to go towards the finished floor. 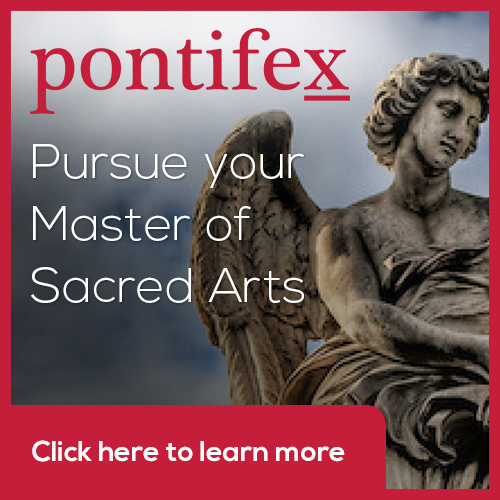 So here's your chance to contribute to the rebuilding of Catholic culture. Contact me if you would like to donate and I will put you in touch with Amy and the church. What inspired you to start this project? Initially, it was the Way of Beauty program in freshman year. 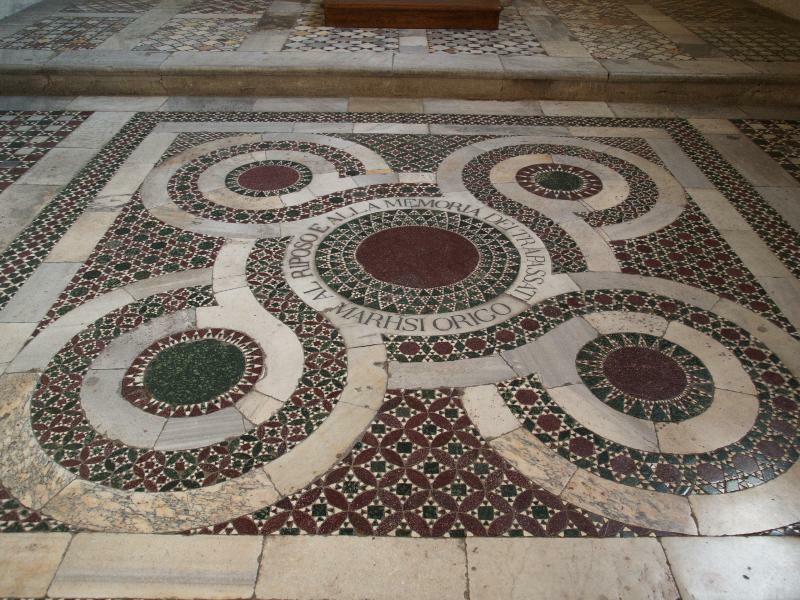 Then, it was furthered by going to Rome and seeing the Cosmati floors in person; in particular, the floors of San Benedetto and Santa Maria in Trastevere. Could you describe a little more how the Way of Beauty Program was able to help you with this design process? In the second semester of freshman year, Mr. Clayton focuses in on Euclid’s geometry and how it is applied in various art forms. At the end of the semester, we were asked to design a Cosmati floor using the techniques we were taught through the program. I was so struck by how easy this project was and how beautiful the floors turned out; which was incredible for me, because I have never been able to draw. Currently, I am taking the St. Luke art guild in which Mr. Clayton is able to help me with the design of the floor! Where are you in the process of design? I’m in the middle of designing the floor right now. Once I finish the design and our parish has raised the necessary funds for the floor, the project will begin. There are several parishioners who have offered to donate their time, talents, and materials to lay the floor. 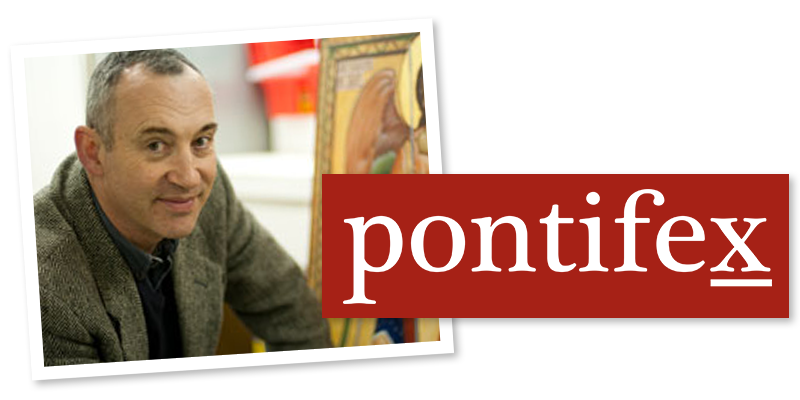 It’s going to be local parishioners and people from our town (including non-Catholics) all working together on the floor, cutting and laying the tile…. it’ll be like medieval times, when everyone from the village helped out. I am also designing a website whereby people can donate to the project to help purchase the tile. I am hoping to have the website up and running by the end of this semester. Is this something you would like to continue doing after the project is finished—after your tenure at Thomas More? If there are other opportunities, I would definitely be open for exploring them. It’s so exciting to be able to use the education that I’ve received here so soon—even before graduating. One of my hopes for the cultural renewal is the revival of a Christian form of geometric patterned art. With this in mind I have done my best to study past work, and try to discern the principles that underlie its creation. I wrote about resources that help in this respect in a previous article, here. 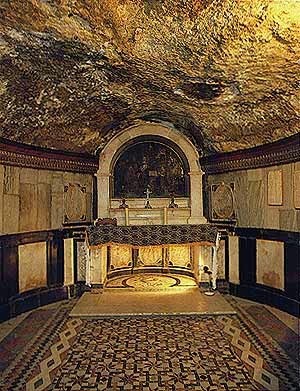 If tasked with the design of an ornate sanctuary floor now, for example, how might one go about it? One approach, which was used by the Cosmati craftsmen of the middle ages was to have a large design for to fill the whole shape and then to infill with a variety of different geometric patterns. The Cosmatesque style is named after the Cosmati family which, over several generations, developed this distinctive style of work. If they were covering a large area, such as a whole church floor, they worked on three scales. For the grand form they tended to compartmentalize into rectilinear shapes. Then the sub-form would be a geometric design consisting of faceted polygons or interconnected circles. The final stage would be an infill of with very small repeated regular geometric shapes such as squares, triangles of hexagons (which are the three forms that can put together without creating gaps). One of the sub-forms is called the ‘quincunx’. This the generic name for the arrangement of five equivalent shapes that has four arranged symmetrically around the fifth which is centrally place (it is also a game-winning word in Scrabble so it'll pay to remember this, if for no other reason). The five dots on dice, for example, are in a quincunx shape. I understand the name comes from the Latin for five-twelfths, a coin of this fraction value of the currency had this name and often had this arrangement of dots on it. In the context of geometric patterned art, it is the shape of four smaller circles spinning of larger secondary one was not limited to the Cosmati craftsmen. 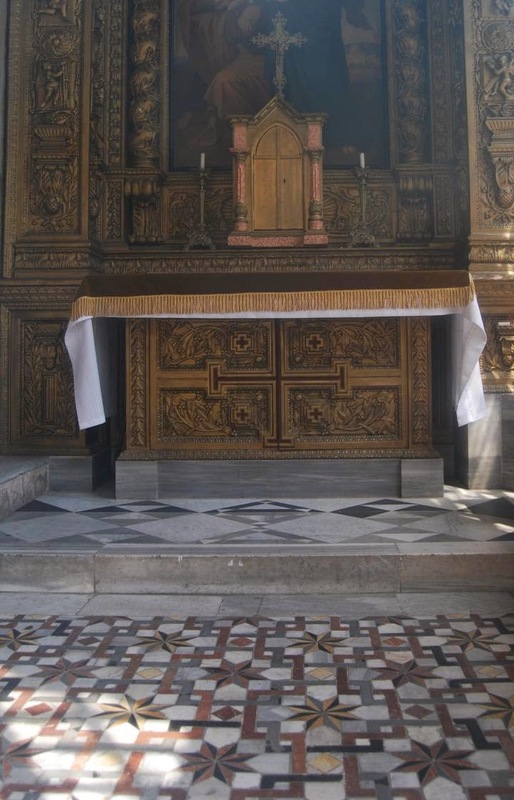 It is seen in both Eastern and Western Churches and across many centuries. I am going to setting my class at Thomas More College the task of designing and drawing a sanctuary floor based upon this design later this term. In some respects the quincunx can be thought of as the geometrical equivalent of the traditional image of Christ in Majesty. Around the central image of the enthroned Christ we see four figures representing the four evangelists carrying the Word to the four corners of the world. One of the reasons that the Church settled on four gospels was to emphasis this symbolism (see St Irenaeus writing in the 2nd century AD in Against Heresies). The quincunx also symbolizes Creation, as the number four represents the cosmos. The symbolism is of, again the four corners of the world - Christ spoke of the 'four winds'; and the four ‘elements’ of the ancients from which all matter is comprised. These elements are fire, water, earth and air. In modern science the work element has come to mean something more specific than this. However, this does not invalidate this symbolism, to my mind, for they still symbolise very well, I feel the phases or states by which modern science categorises matter – solid, liquid, gas and energy (or alternatively plasma). In his book on the Westminster pavement, which is the one example of Cosmati work in England, Richard Foster suggests that the inscriptions indicate that rather that signifying Creation, the quincunx signifies the final end. That is, rather than emanating from God, all is returning to God.